These Heavy Duty Air Curtains can be used above entry doors and industrial warehouse doors to prevent loss of cool air and maintain a clean environment. These curtains contain a heavy duty 20 gauge rigid steel cabinets, with baked on epoxy powder coat paint for durability. Motor is a heavy duty, PSC, direct drive high efficiency and signed for use with SCR controllers. Motors are permanently lubricated for long life and have thermal over load protection. SCR speed controller supplied on all units compatible with the motor with low end adjustment for air volume control and savings in power consumption. 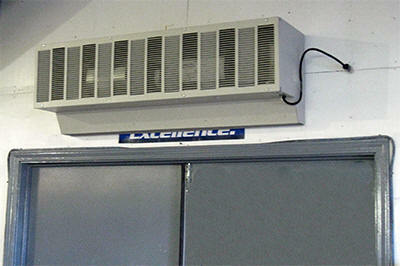 These heavy duty units have a ¾ HP motor, and can go up to a 12’ high doorway. Number PDFs Description Dimensions CFM Volts Wt.